Get the first volume of this critically acclaimed series for only $10 as part of Oni's Square One program! Courtney Crumrin grumbles about everything, but now she's really got something to grumble over. Having run out of credit cards, her parents are moving to the wealthy suburb of Hillsborough, to live rent-free with their creepy old uncle Aloysius. Courtney is now an outcast among her rich, snobby classmates. And if that weren't bad enough, the musty, decrepit old mansion that she now calls home is occupied by stranger creatures than just her parents or Uncle Aloysius. They crawl about the house, just out of sight. They crunch bones in the corner. They climb up on the bed and watch Courtney while she sleeps. Mom and Dad don't notice them, but Uncle Aloysius calls them the Night Things. Ted Naifeh first appeared in the independent comics scene in 1999 as the artist for Gloomcookie, the goth romance comic he co-created with Serena Valentino for SLG Publishing. After a successful run, Ted decided to strike out on his own, writing and drawing Courtney Crumrin and the Night Things, a spooky children’s fantasy series about a grumpy little girl and her adventures with her Warlock uncle. Nominated for an Eisner Award for best limited series, Courtney Crumrin’s success paved the way for Polly and the Pirates, another children’s book, this time about a prim and proper girl kidnapped by pirates convinced she was the daughter of their long-lost queen. Over the next few years, Ted wrote four volumes of Courtney Crumrin, plus a spin off book about her uncle. He also co-created How Loathsome with Tristan Crane, and illustrated two volumes of the videogame tie-in comic Death Junior with screenwriter Gary Whitta. More recently, he illustrated The Good Neighbors, a three volume graphic novel series written by New York Times best-selling author Holly Black, published by Scholastic. In 2011, Ted wrote the sequel to Polly and the Pirates, and illustrated several Batman short stories for DC Comics. 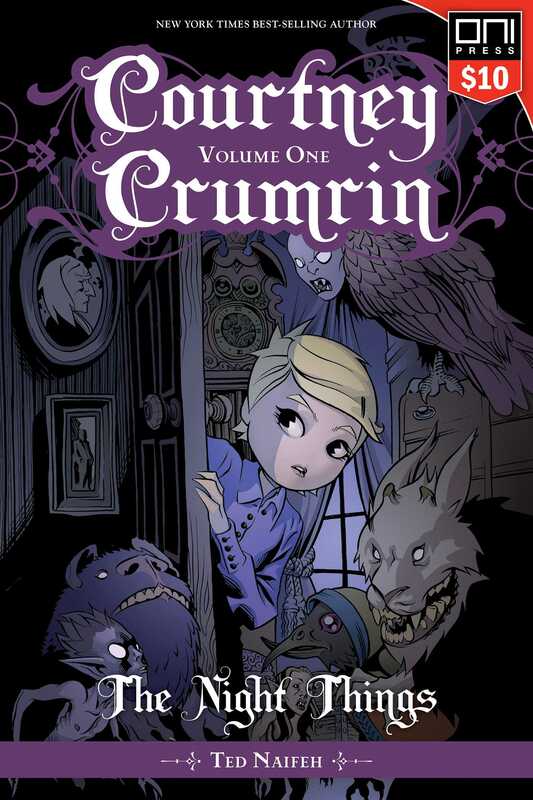 In 2012, to celebrate the 10th anniversary of Courtney Crumrin, he wrote and illustrated the final two volumes of the series. Currently, you can find Ted everywhere: from the pages of Batman ‘66 to his newest original series for adults, Night’s Dominion. Ted lives in San Francisco, because he likes dreary weather.